Find Me at DragonCon 2012! Phew! DragonCon is just a week away over the Labor Day weekend! 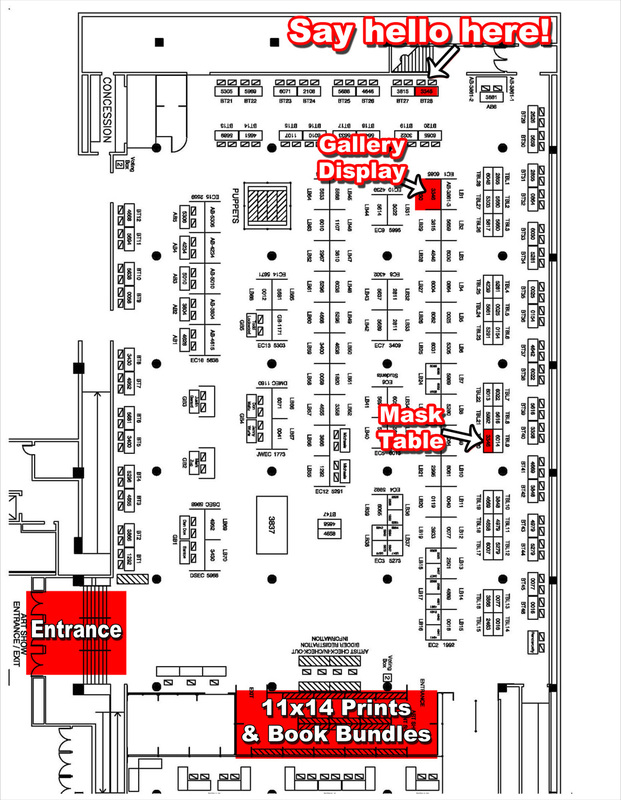 It occurred to me that I have such a large spread out presence this year at the show, so here’s a handy map to help you find me and all my bits and baubles this year. For you Dcon newbs out there, the way you get to the art show is to come in at the ground floor of the Hyatt hotel, take two escalators down, then you’re there! There will be a banner across the top of the door that says Artist Alley. 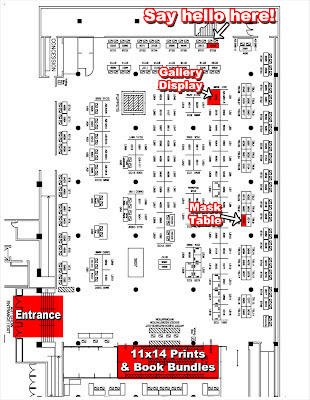 We’re sharing a partitioned room with the Comic Artists Alley as well! Meet Me Face to Face! I’ll be manning a table in the far back left corner with my wonderful boyfriend, Kevin, so be sure to come say hello to us! I’ll be right next door to my good friend Brenda Lyons, known in most parts as Windfalcon. 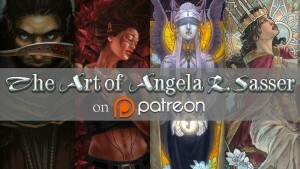 I’ll have prints, bookmarks, and copies of my art book, Angelic Visions, on hand! If you want anything in particular, be sure to let me know and I can bring it for you. You can also order the sketch option for your book at my Etsy shop and I can give it to you at the con. Just let me know and I’ll refund your shipping if you are picking up from me directly at the con. My gallery display will have a mix of my masks, limited edition prints, beautiful large canvas prints, and embellished ACEO prints this year. You can find 11×14 open edition prints and book bundles in the print shop this year as well! I’ll be hosting my panel on creating leather masks at 7pm on Saturday in the art track, which is in the twisting labyrinth of hallways known as Hanover right next to the art show on the same floor. I’ll have handouts of supply lists and a 50 minute instructional video, so be sure to come if you’re interested in my creative process for masks! 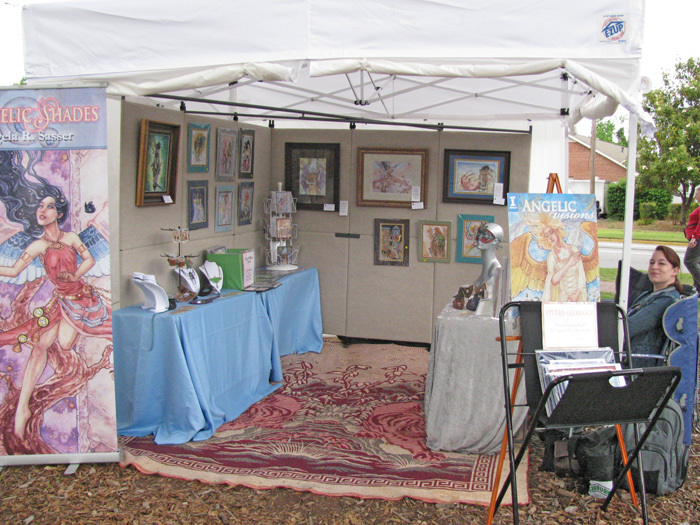 After a day of rest and a couple of Advil, I’m pleased to report I have survived my first art fair! All in all, I did fairly well for a first timer. Made back my booth fee, got suggestions from the crowd on what they wanted to see, and learned the secret of good transportation of random stuff — plastic tuberware! What did I learn from this experience? Read on! 2 weeks was not enough to make even half of the items by hand that I wanted to fill up my artisan display tables. I found myself painting into the wee hours and relying on a lot of older stock I had lying around just to make my booth look presentable. First lesson learned! Start early, DO NOT STRESS YOURSELF by procrastinating! Know your display capacities. Practice your setup in advance. Last thing you want is it to look empty and rushed. Also, check your current stock! I had to reorder many prints last minute because I didn’t realize I was low till that moment. Doh! Heeey! Buy my stuff. Please? YOU KNOW YOU WANNA! While this isn’t terrible, I think I did this because I’m so used to setting up at conventions where you put the table out front and people come up to you to talk. This layout drives people right up to you, but what I noticed at the fair is most people will talk to you, but then not browse your wares, or they’re intimidated by your presence and just want to be left alone to shop. I also had a technical issue where I couldn’t find the stiffeners for my walls, so I couldn’t line the sides of the booth with them, leaving it looking pretty empty on the left. Psst! Hay man. Need a kidney? Operating table in the back! Much more open space and plenty of room for multiple browsers to go down the line of pretties! Artist hidden away and only there if you need her to checkout or to ask questions. More people came in this time round and didn’t have to peer over my head to come right up to the artwork. This was a huge surprise for me! I thought my crafts would do well, but I only sold a few things. Mainly I sold art cards and prints because people wanted small artwork to inspire them (but didn’t want to buy the more expensive larger pieces on the wall). I also sold a few books to people who saw my work elsewhere and liked that I offered personalized goodies for free if they bought it directly from me. I didn’t sell a single mask. I had a good many requests for hair brooches with chopsticks and lapel pins of the butterflies. No doubt due to having a generally older crowd (with grandkids along) who were looking for things for their home or small gifts, of which matted/framed Fantasy art is generally not well suited for your average collector. 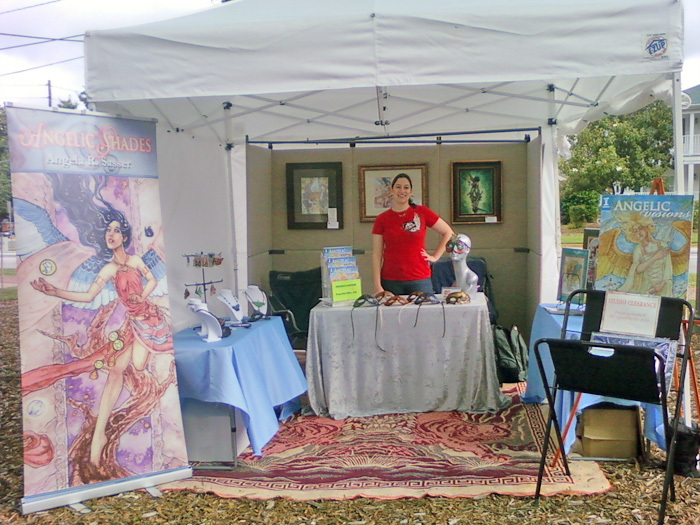 Next time I do an outdoor fair, I plan to carry more personal items (hair brooches and pins), more ornate masks framed in shadowboxes, and more accessible 2D art items (perhaps carved leather butterflies in framed ‘specimen’ arrangements?) If people can see the use of an item for their home or their personal decor, I imagine they’d be more inclined to buy at these sorts of events! I can save my fantasy art for more themed fests, like the Renaissance Faire or the cons I attend. That’s at least one joy of being a multi-faceted artist! I am sore and sleep-deprived far more than I ever was for a plain ol convention! Art fairs are physically grueling work and not for those who can’t handle the hauling, unloading, and long hours. It’s also a HUGE investment of time and money. The fair season has only begun for me, however, so I’m not going to give up on it just yet! Being able to talk to fellow art lovers and curiosity seekers was quite enjoyable for me! Even moreso when they would tell me they saw my work online or at the gallery next door. Getting your face out there can be very gratifying and just as important as sales. For my shy artist friends, however, this definitely may not be the thing for you! If you’re a fan of my Facebook Fan Page, I’m having a sale on leftover hand-painted butterflies. Get ’em while they’re cheap because they’ll be going up on Etsy for a higher price after this week! See one you like? Check out my sekrit sale! Stay tuned for a post on what makes up an art fair display. Till then, I’m going to attend to the mess that is my trashed studio after an event. *cry! Check this out! It’s my own spiffy vendor page! This’ll be my first year as a vendor! I’ve always attended as the nervous geek hitting up people like Joe and Dave and gushing about how much I love their work. It’s a joy to think that this year I’ll be on the other side of the table! I’ll be bringing the usual – prints, art cards, mousepads, glass tile necklaces, and remaining leather mask/keychain inventory. If there are any specific things you’d like me to bring along for you, let me know! In addition to my usual fair, I’ll also have an advanced copy of Angelic Visions there for folks to flip through and will be taking pre-orders personally! If the mail gods are with me, I’ll also have some Angelic Visions Calendars on hand! Hope to see you cool cats there! If you’ll be in my neck of the woods come January, I’ll be launching a barrage of Angelic Visions events starting the first Friday of January, ALL of which will be hosted at our local gallery, Artworks on the Square! 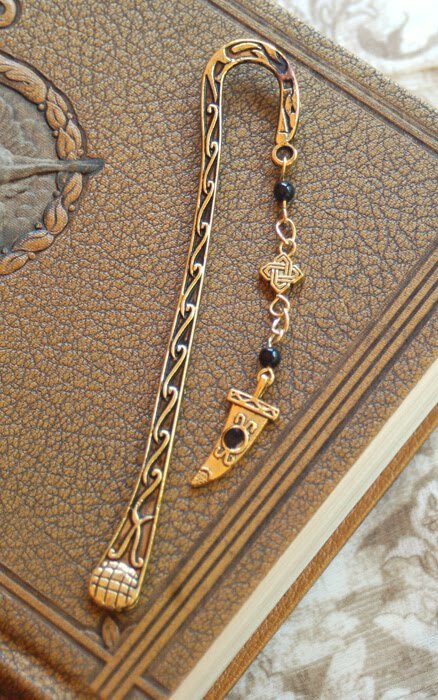 Read on for more and your chance at prizes and pretties. 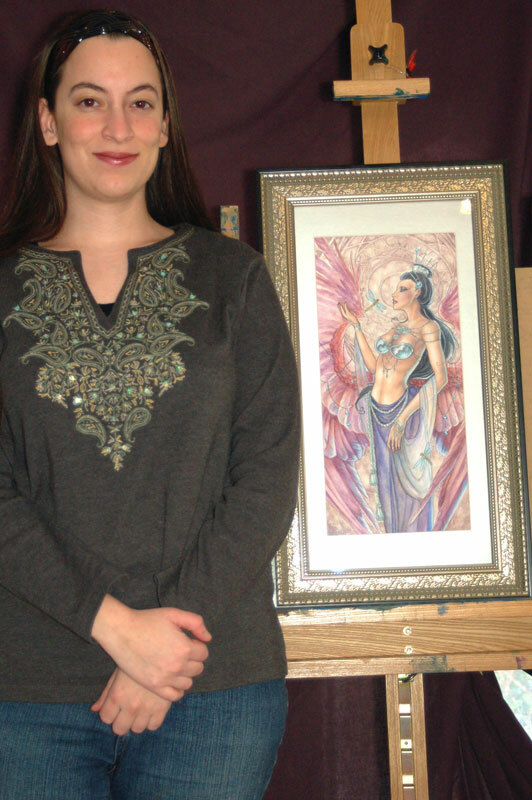 Selected artwork from Angelic Visions will be on display for the entire month of January with a reception on the 7th. Wine tasting and live music provided! Join us in celebration of the debut of Angelic Visions! Door prizes will be handed out to the first lucky few with prize raffles going on throughout the event. 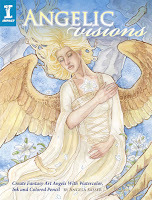 You could win a free copy of the book, the Angelic Visions themed calendar, and other such goodies! Food and drink will be provided, of course! Can’t have a shindig without them! Join me for a demo on how to render skin tones in color pencil and a rundown of the basic tools of the trade. Appropriate for all skill levels. $25 per person. (No materials required as this is a demo/lecture sort of class). Mark your calendars! I’ll be sprinkling reminders as these dates approach. I hope to see some of you locals there! Also, still taking Pre-Orders, for those who are interested in the special bundle direct from the artist. Q&A With Jacqueline Carey Event! Anyways, the point of this particular entry is to set your eye on an event going on this coming Tuesday, June 1st! My fellow plotter, upcoming author, and friend, Hayley E. Lavik, is having a Q&A event with Jacqueline! 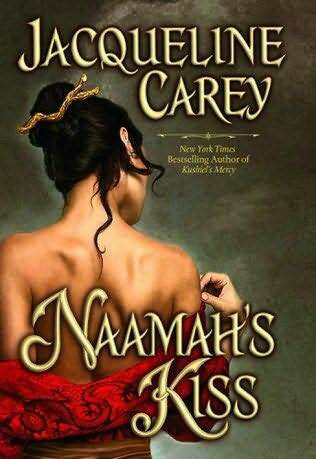 Check Hayley’s entry on the matter for details, as this could be your chance to win hand-crafted swag of my creation and a copy of Jacqueline’s latest release in the series, Naamah’s Kiss. Not to mention how wonderful and rare it is to have questions answered by a best-selling novelist in the themes of world-building and advice for aspiring authors everywhere! So set your calendars and don’t miss this event!